Posted on December 7, 2018 by Atlas Chiropractic, P.C. While many of us look forward to the fun and festivities of the holidays, there’s no denying the season also brings its fair share of stress. Juggling travel plans, financial burdens, and family gatherings is enough to put even the most stable among us on rocky ground; add the inevitable fear of gaining weight due to over-indulgence, and it’s no surprise nearly 25% of Americans report feeling “extreme stress” over the holidays, according to a poll by the American Psychological Association. The holidays happen every year, so if you know it’s a difficult season for you, take steps to prepare yourself as early as possible. Determine which holiday activities are most important to you, prioritizing those that bring you the most joy. Whether you love shopping, cooking, visiting friends or partaking in holiday-specific events, go ahead and assemble your shopping lists, put together menus, and write to-do lists. Then start scheduling these activities, so you’re sure to have time to enjoy them. Being proactive will give you time to relax and appreciate the season in your favorite ways. 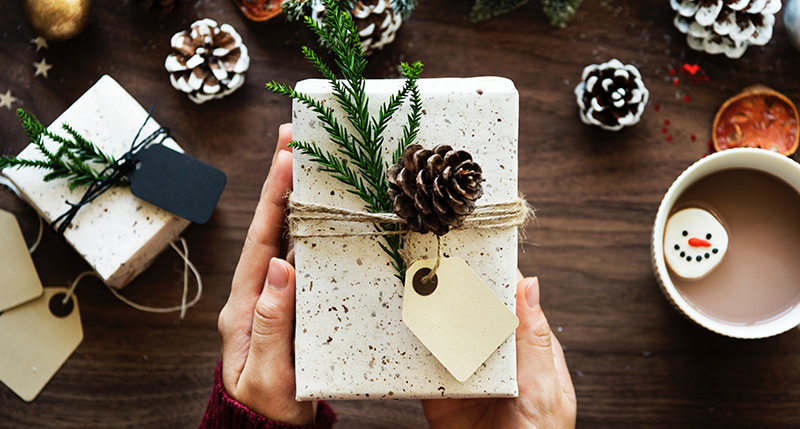 Every advertiser wants you to believe your holidays won’t be complete without their product or service, but how do you define a successful season? Rather than going with the advertising flow, take a few moments to unplug from the noise and look within for answers. What are you expecting of yourself and others this season? Are those expectations realistic, or will you likely be disappointed? If you find your bar may be set too high, commit to keeping an open mind and going with the flow this year. Feeling overwhelmed by commitments? You’re not alone. One study showed that 69% of people cite “lack of time” as a major holiday stressor. This year, instead of caving to holiday peer pressure, remember: You don’t have to show your face at every single event. If a party or holiday activity doesn’t sound like your cup of tea, thank the person who invited you, and let them know you’re unavailable. The holidays can be a time of joy, but seasonal festivities can stir up deeper emotions, too, especially if it’s been a rough year. If you recently lost a loved one, went through a divorce, moved away from friends and family, or experienced another major life upheaval, it’s okay to feel sadness and grief. Don’t force yourself to be happy for the benefit of others. Instead, acknowledge how you’re feeling, and give yourself time to work through your emotions. It’s okay if this year doesn’t look like last year. As families grow and change, holiday traditions often morph as well. Rather than holding yourself to an old way of doing things or feeling resentful when traditions shift, choose to be present in the moment. If you can’t uphold the same traditions as you used to, find new ways to celebrate the season and convey the same feeling of togetherness. Feeling like there’s not quite enough to go around this year? Instead of wishing for what everyone else is displaying, doing or giving, focus on raising your awareness of all the good things already in your life. Be grateful for what you have, and you’ll find abundance and richness this season. With so much going on throughout the holiday season, it’s easy to put everyone else’s needs before your own. But if you want to make it through the month with your head on straight, it’s important to prioritize your individual needs. Spending just fifteen minutes a day practicing mindfulness meditation can reduce stress significantly by slowing your breathing and calming your mind. This year, don’t let the holidays overrun you. If you take steps to proactively address your triggers and shift your mindset, you’ll soon discover you can find peace and joy this holiday season.